Hey ladies!! 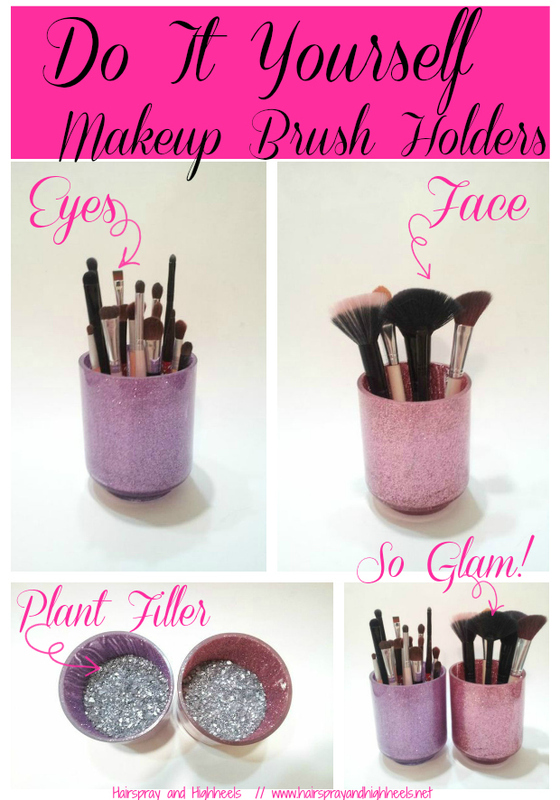 I have said a million times before that I have a serious YouTube watching addiction and a few weeks back I watched one of Ingrid’s (Miss Glamorazzi) videos where she did a GIY = Glam It Yourself Makeup Brush holders and I loved it so much. Previously I had my makeup brushes in a giant wine glass (don’t judge me) so I decided this would be the perfect thing to recreate because it was something so simple and I hadn’t thought of it before. I’ll link her video below so you can see how she did it but basically it’s fairly simple. She uses used candle jars in her video but I didn’t have any big enough so I went ahead and just grabbed to clear glass tumblers from Walmart for $1.88/each and I already had the Mod Podge from Michael’s because I do so many other household crafts. 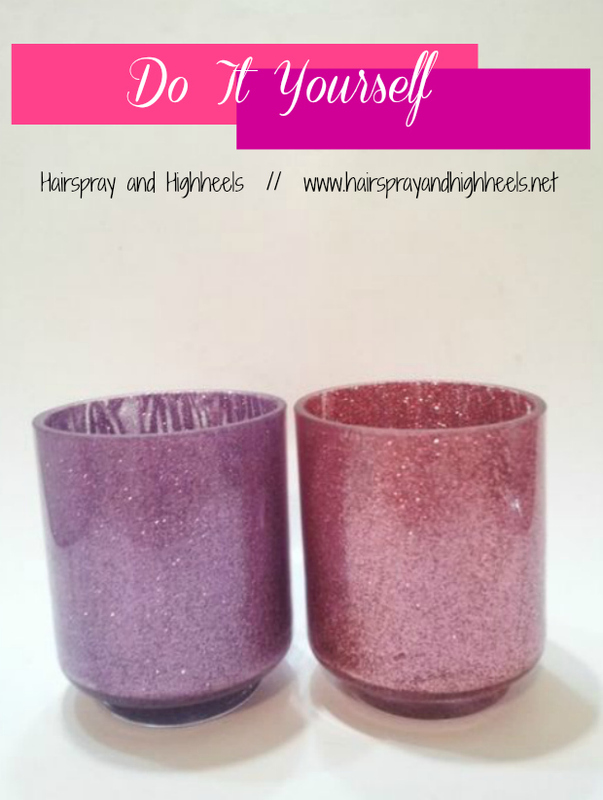 I took and old paint brush and painted the Mod Podge into the inside of the tumblers and then grabbed some pink and purple glitter that I got from Walmart for $3.49 and sprinkled it inside until it was covered. Once finished you flip them upside down and let them dry over night in a cool area. It’s perfect since you do it all in the inside you have that clear glass finish on the outside. 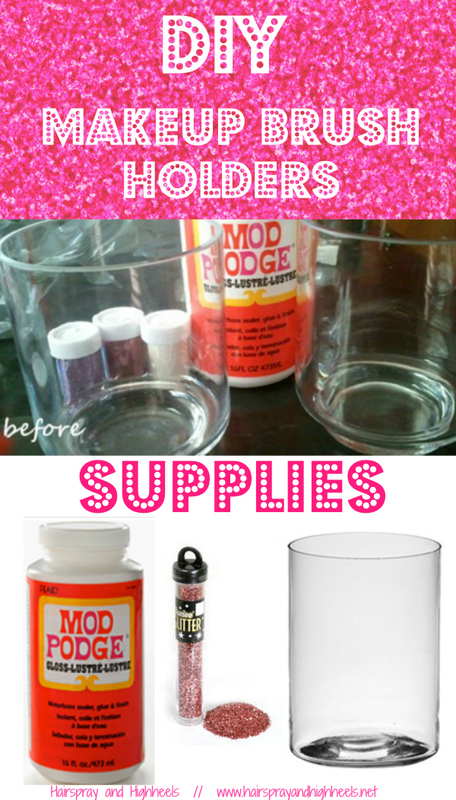 Mod Podge dries clear so all you see is the glitter! I then grabbed some little plant filler beads and dumped them in so there would be something to hold the brushes. I’m just loving this!! THIS. IS. AWESOME. Perfect project for this weekend. I’m also YouTube addicted right now! Loving the whole Fleur/Ingrid/Tanya and all their significant others VLOGS/videos in LA. These are so CUTE !!! I will have to try it out myself. Thanks for sharing. Found your blog through BBU and I love it! So cute! These are adorable! I’ll have to try this! I’m a new follower from The Things We Find Inside! Can’t wait to read more! This is awesome. I need to do this! Thanks <3 love Jersey Girls!! What part? Thanks <3 Definitely try it out!! Let me know if you do! I wanna see!! I love this idea. I need to get some of those little beads for my brush holder. These are not only functional but pretty too! It is a great way to keep all those brushes in one place. So cute! Thanks for sharing at the All Star Block Party! Thanks girl!! Also, I LOVE your blog name, following back!! I thought so too!! Thanks!! Love your link up!!! They’re so fun!! I’m loving them!! luv this idea! do you paint the inside and then dump glitter in it?